God is a God who will do everything possible to make us righteous. We should also note our cooperation is required. We can’t be righteous if we do not accept it from God. God wants us righteous so we can be ever with God. Now is the time to decide if we will accept righteousness from God, or not. Two weeks ago we looked at righteousness from the perspective of the Word being near. The Word of course is the Word of God, which we see sometimes as scripture and we also know as Christ himself. Jesus is the living Word and his message becomes the living word. Through him we come to know the word, knowing the word brings us near the Word. The old covenant readies us to know how significant God’s word is and can be, it leads us to be ready for God. Last week our readings pushed us to recognize we are citizens in heaven. Like citizens anywhere, to be a citizen of heaven comes with certain rights and responsibilities. We have the right to be treated equally, with freedom and trustworthiness. Also, we are responsible for living up to our citizenship by representing heaven well, encouraging others to immigrate (become citizens of heaven) and to be united with every other citizen of heaven. As we claim our citizenship in heaven, how we live will ready us more and more to receive God’s grace of righteousness from God. This week we are guided by the readings to repent or perish. To repent can mean to regret something. However in the gospel the word is based very much on the idea of changing direction. Jesus came so we could become new in him. In Jesus we are called to live a new life, to turn from the life we lived without Jesus and to live our live completely within Jesus. If we do that we will live eternally, if we don’t change we will perish. 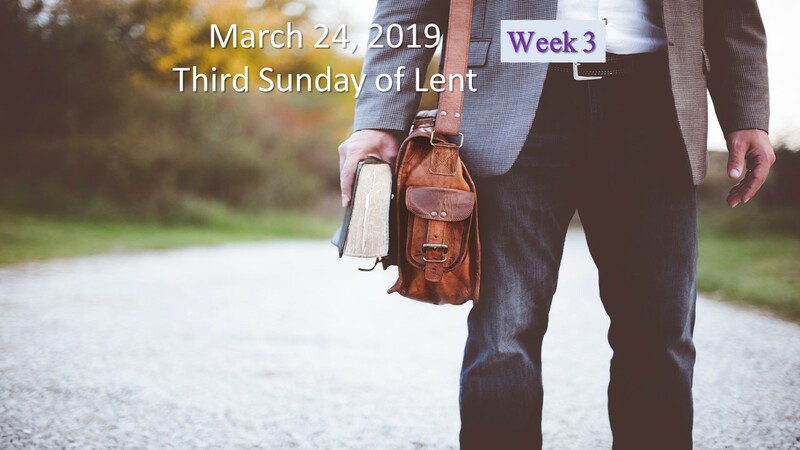 The readings this week are from the Lectionary for the Third Sunday of Lent; Exodus 31:1-8a, 13-14; Psalms 103:1-2, 3-4, 6-7, 8, 11; 1 Corinthians 10:1-6, 10-12; Luke 13:1-9. The readings guide us this week to change how we live, to turn toward Jesus and live a life with him as our Lord. In the first reading from the Book of Exodus we read the call of Moses by God from the flaming bush. God is sending Moses to Egypt to bring his people out of slavery and into a new life on a new land that God has planned for and promised their forefathers he would do. We see many people called in the chapters of the bible, people that are God’s representatives. This call to Moses completely turns his life around. Moses led an obscure life tending the flock and now God wants him to tend to God’s people. It is a new life for Moses, one that creates for him an image of leader that lives forever and in fact becomes a type that Jesus models. We also hear Moses getting God’s name, as I AM. He tells Moses to say to the people that I AM sent me to you. God is everywhere and in everything, God is. I am not sure if Moses, the Israelite’s or even us understand but it says God doesn’t change and never will change, doesn’t need to change. Moses, the Israelite’s, us, all need to repent, we all need to change to stand next to the great I AM. We need to follow God to become righteous from God. In the second reading from Corinthians Paul is speaking to the people about changing their ways. He uses the Exodus of the people under Moses as an example. Following Moses freeing the people from Egypt they began their journey to the Promised Land. But along the way they worshiped idols and dishonored God, despite all that God had done. After being delivered from slavery and fed miraculously in the desert, many perished. In their sinfulness they spent many years in the desert and many never reaching the Promised Land. Paul tells the people of Corinth, if they don’t change their ways they run the risk of falling into the same sins as their spiritual ancestors. Paul tells them they are making similar mistakes and list several of their sins warning them that they must change. If they do not change they will suffer death. Paul list their sins as idolatry, immorality, testing Christ, grumbling and complaining to God. Paul is telling them to change, to turn their lives around, noting if they don’t they will perish at the hands of the destroyer. These are people who have come to faith because of Jesus and yet they still are influenced by power and thinking; they know better than God. It is a common temptation to succumb to power, one we must be careful to avoid. We must repent, turn away from our sin and toward God, not just one time, but constantly, daily in fact. Each morning we wake we must choose God and avoid all that pulls us away from him. In the gospel reading from Luke Jesus is challenged by some wondering if people who were put to death by Pilate were greater sinners. Jesus uses their question to say the people who are put to death by Pilate, or people who die through an accident are no greater sinners. It is a common idea at the time, if you met with misfortune it is likely because God knew your sin and let your early end happen. Jesus indicated all people have a reason to repent and if they (we) don’t we will perish. Jesus is indicating we need to change how we live because we never know when our life will end. We must live following God rather than living selfish, self-centered lives or we will perish. We never know when our life will be demanded, weather from accident, human malice or some other reason, so we must always be ready. Jesus then tells the story of a fig tree that has been barren for three years, and so it must be cut down rather than be a waste. It is an indication that there is a fixed time we have to repent, and if we don’t, then we will be tossed out of the vineyard, the Kingdom of God. The gardener begs for a little more time and Jesus capitulates but it is still a fixed time. We must turn ourselves toward God, and do it often, so that we do not find ourselves like the fig tree. Bearing no fruit and set to be tossed out of the vineyard. God is patient, but eventually time does run out for a chance to change, to repent and have life. These three readings all have a flavor of life change. Moses’ life was completely changed as he became an agent for God. The Corinthians who Paul wrote needed to change or repeat the history of their spiritual ancestors who perished in the desert. Finally Jesus speaks specifically to all who hear his words that change, repent is critical or there is no life, we will only perish. We are constantly pulled toward a life of power and self-centeredness. Jesus’ life is one that is lived for others, we must follow this example. We must fight our natural inclination to do all for ourselves, to put ourselves first, to put ourselves even before God. Because we if don’t change we won’t have a chance at righteousness from God. God provides the grace of righteousness when we repent, and follow the example of Jesus, to always do the Father’s will. For church people when we hear this challenge from Jesus to repent we naturally think about sin, and how we must avoid sin. In order to avoid sin we corporately declare law, so that we know what to avoid and what is okay. Many of us were even given a definition of sin with three requirements; 1) you have to have full knowledge, 2) it has to be a grievous matter, 3) you had to give it full consent. So if you took your neighbors car, you had to know doing so was a sin, it seems quite a grievous matter and you had to do it knowing you are sinning. But, suppose you knew all these things and took the care because your child was in an accident and you had to get them to the hospital as quickly as possible and your car was with your wife somewhere. So there are extenuating circumstances in certain cases. We might think it sounds reasonable to set rules that define boundaries but we don’t end up with a biblical definition of sin, it is more juridical, where we can easily identify it, shame it and enforce it. With juridical law the circumstances of stealing the car have no place in the discussion, the reasons are not accepted. But Jesus doesn’t rely on the law, and Paul tells us the law helps us move toward Christ but it cannot save us. He makes it clear: Laws can only give us information, and even helpful information, but it cannot give us transformation. (cf. Romans 3:20; 7:7-13) In terms of the bible and our overall movement toward discipleship, the law set the foundation, but Jesus calls us not to law but to relationship. So by calling us to repent Jesus is calling us to put others first, see the value of others, be more concerned about others and don’t try and hide our own vulnerably because we don’t look so good to others. How others see us never matters. Our journey is to spiritual eternity, and our physical self won’t carry what others think of us into that eternity. Our journey is to freedom. Paul claimed himself to be perfect in the law and yet he himself is responsible as a murderer (cf. Philippians 3:6-8). It was perfect religious observance that created hateful and violent men. We read from Paul, “Sin takes advantage of the law” to achieve its own purpose. (cf. Romans 7:8) So the law doesn’t exist to help us repent, or to be transformed followers of God. And following the law doesn’t make God love us, God already loves us. God did not create the world for obedience to law, religious leaders are not policemen for the law. Jesus is not telling us to repent from sin, particularly juridical sin. God allows us to make mistakes, in fact God uses our mistakes in our favor. This is the grace that God provides moving us to righteousness. When we stumble and see more clearly afterwards, we have grown nearer to the image of Jesus. We repent when we see others as someone to love, someone to serve, someone to put before ourselves. This is the life Jesus lived, everyone came before his own needs. This is repenting in the eyes of God, it is changing our lives from inward concerns to concerns of those around us. The Kingdom of God is near when we bring it forward through our giving, living transformation, sharing our experience of Jesus. The path to righteousness is a path through repentance. We change our lives to live more like Jesus and do the will of the Father. To receive righteousness from God we must turn away from our natural inclination to be self-serving, prideful and hypocrites. When we change and turn toward God, we become models of righteousness, we are God’s disciples and our life is filled with hope. Jesus calling us to repent or perish is for us to completely turn around. Repent and receive perfect righteousness from God. Of course we don’t just repent once and are done, we must constantly turn away from what separates us from Jesus, repenting daily if necessary.